Ultimate Fighting Championship (UFC) will make history in less than three weeks (Sat., Nov. 14, 2015) when it not only breaks ground in Melbourne, Victoria, Australia, but does so with a women’s championship doubleheader inside the 60,000-seat Etihad Stadium. That’s where reigning women’s bantamweight champion Ronda Rousey squares off against unbeaten 135-pound No. 1 contender Holly Holm. In the five-round championship co-main event, strawweight roost ruler Joanna Jedrzejczyk puts her 115-pound strap up for grabs against the venerable Valerie Letourneau. Be sure to tune in later today (Thurs., Oct. 29, 2015) as all four ladies field questions from the mixed martial arts (MMA) media, beginning LIVE at 5 p.m. ET (2 p.m. PT) in the embedded YouTube player above. 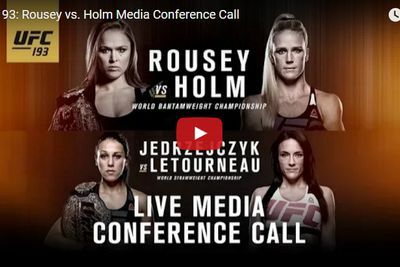 For much more on the upcoming UFC 193: “Rousey vs. Holm” pay-per-view (PPV) event click here and here. To see who else is fighting “Down Under” check out the latest and greatest UFC 193 fight card and rumors here.